Greenbriar Picture Shows: His Most Terrifying? 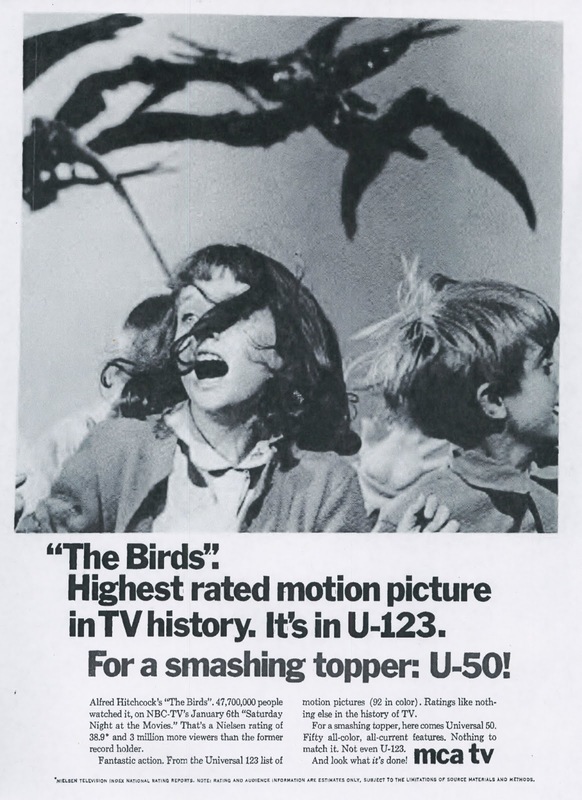 When THE BIRDS aired on network TV I was not allowed to watch it, being 8 years old. That was a mark for me and I finally saw it a couple of years later. I was so excited but wound up thinking the film was 'OK". 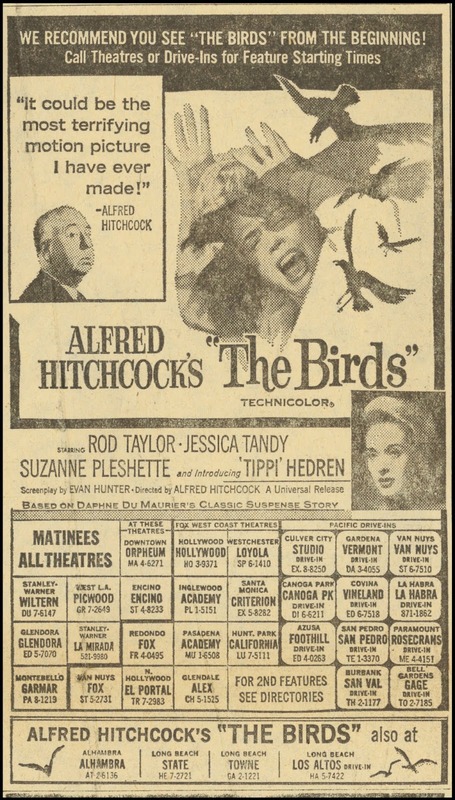 Although I may have seen THE BIRDS when I was very young on TV, the first time I remember seeing it formally was when I was around 15. 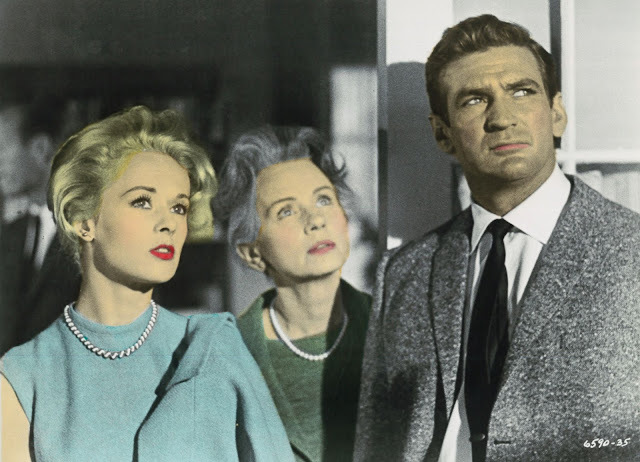 The film seemed and still is OK, even though I felt that most of the visual effects felt cheap, but it is far from Hitchcock's most memorable works (some of the TV episodes he personally directed or even some which he only produced are better). The biggest shock I felt seeing it was the ending when the Universal logo appeared (which Hitchcock didn't like either). I never liked how the film ends but after a while I had to agree with you that I don't know what could have been a better ending for it. I saw that 1968 airing on NBC, and distinctly remember the shot of the farmer with the pecked-out eyes because it scared the hell out of me -- and I was 12. My wife and I saw The Birds on TCM a few years ago. What dates it the most are the obvious matte shots. But Bernard Herrman's bird squwaks are terrific. If memory serves, in his interviews with Truffaut Hitchcock said that the shooting script had the schoolteacher in the attic scene, but he decided it would be stronger to have the heroine there; thus the teacher was killed off earlier. The ultra-prepared director said he didn't like to make changes after shooting had begun, but it felt necessary. ANY explanation, direct or implied, would have diminished "The Birds" Or a conventional ending of any kind. How many horror or scifi films killed the terror -- deliberately? -- by giving it a voice or a seemingly logical basis? If a horrific space beast can articulate his contempt for Earthlings, he's far less horrific even if he wins at the end. 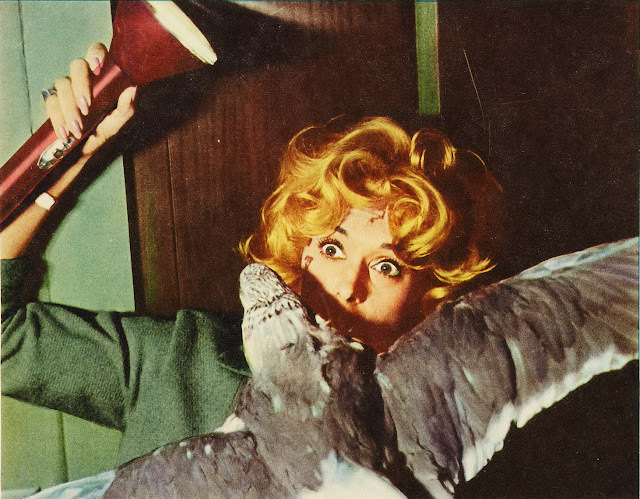 "The Birds" never explains anything; nor does it hint at what follows the fadeout. We only get a radio voice saying it's spreading. There's neither hope nor the catharsis of a definite finish; for all we know the heroine is already beyond help. The MAD satire ended with Burt Lancaster bursting through a wall surrounded by birds. He was wreaking vengeance because he didn't get an Oscar for "Birdman of Alcatraz". THE BIRDS is superb. When it comes to performance we do what we have to do to get what is required. Chaplin had a hell of a time on CITY LIGHTS with Virginia Cherrill. Good thing he got what he needed from her. She will shine through the ages. There was a 1953 radio adaptation starring Herbert Marshall which follows the original short story a little more faithfully, and is - in its own way - every bit as compelling as Hitchcock's film. 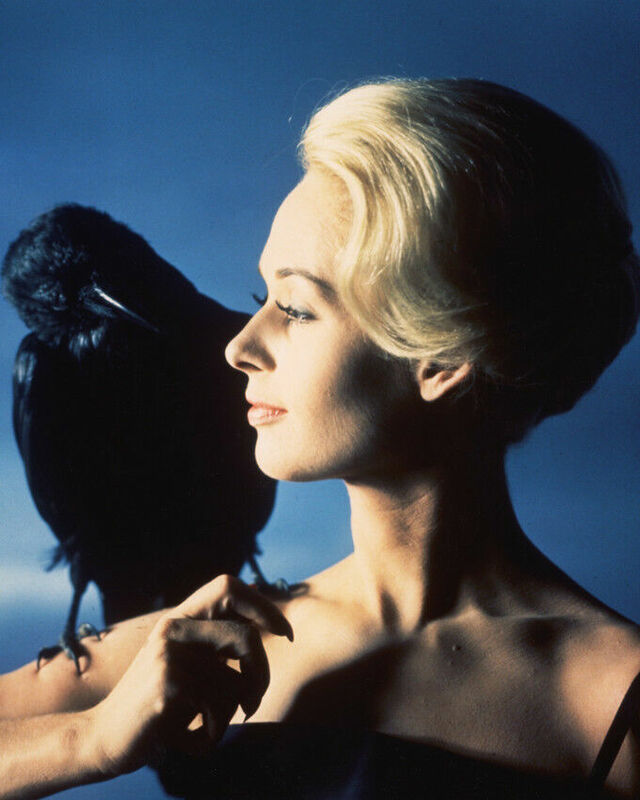 AH's treatment of Hedren had little to do with her onscreen performance. 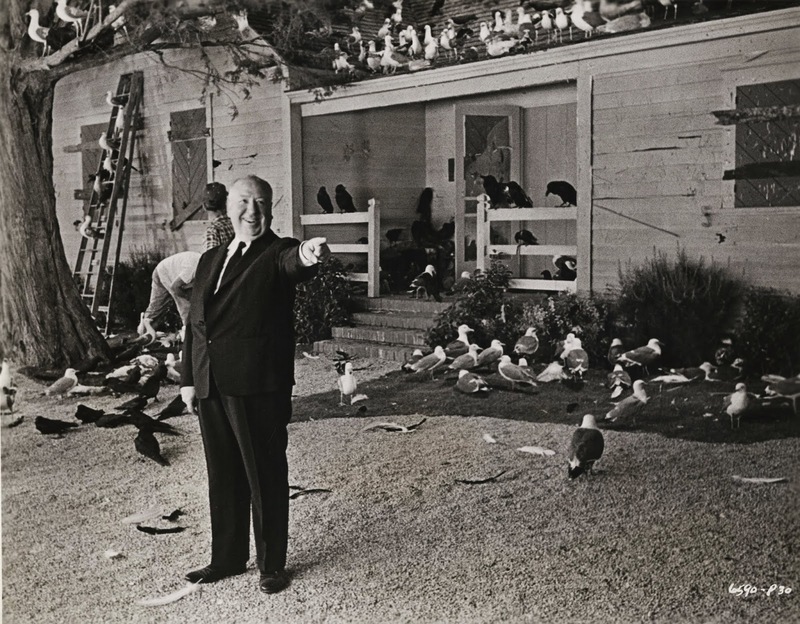 Has any critic ever discussed the Freudian aspect of The Birds? Tippi Hedren's resemblance to Jessica Tandy is just a smidge creepy to Stinky. The decision not to have a formal score was brilliant. You always know it's THE BIRDS when it's on tv. Anyone catch the clever transition in the opening scene? Tippi is seen walking on location in San Francisco, walks behind a newsstand and is now on the Universal backlot! I've noticed that many of the newspaper ads don't list the addresses of the movie theater. Everyone then knew where the cinema was, like city hall. I checked this out for the first time in many years on a TCM Classic Cruise a few years ago and I was in agony through most of it. Nothing but dialogue upon dialogue for far too long, none of it especially interesting or revealing as far as I was concerned. I doubt I will ever watch it again. Barry Rivadue; I love that shot... the best special effect in the movie! Think some folks get a letdown on first viewing since it is often referred to as a horror movie and really isn't. I've always thought this to be the first of a later day Hitchcock era; technical methods he had mastered for decades begin to look a tad dated around the edges, long time collaborators either retire or die off, and director occasionally seems, well, just a little unsure. 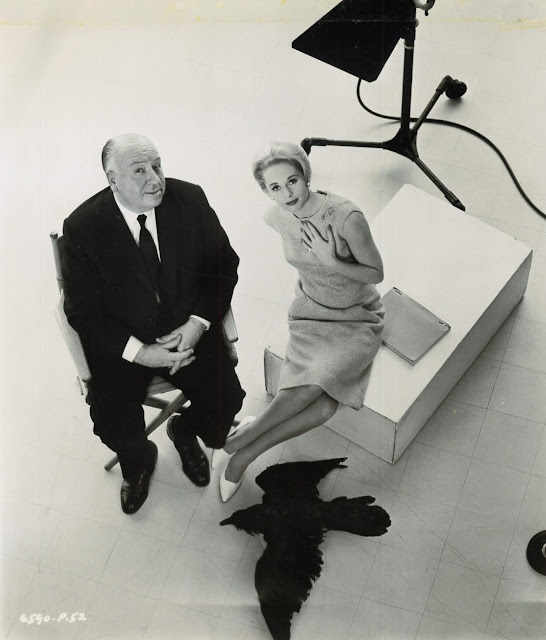 But I really enjoy most of these later films, and love, love THE BIRDS and understand why it remains one of Sir Alfred's signature works. And, yes, Stinky, I'm sure you could fill a library with critical essays on the off center mother-child relationships in the Hitchcocks, this one in particular. It was Hitchcock's intent to have a slow buildup to the bird attacks. I guess it didn't work for everyone! I'm also astounded when Tippi & Rod Taylor stroll on location along some dunes, and then into a massive indoor exterior set. That's a rather nervy illusion to pull off. The Monday morning at school, following the broadcast, was an absolute corner....all anyone, well, anyone male, could talk about was the pecked out eyes....and I think you're right about the cut....it was almost "did I actually see that?...."